I love finding ways to make learning fun and hands on at my house. My kids love learning through play. One day we set out to try baked cotton balls. We had this on a summer bucket list a few years ago and never got it marked off. It was still on my mental to do list and I was not letting another summer get away from us without trying it out. 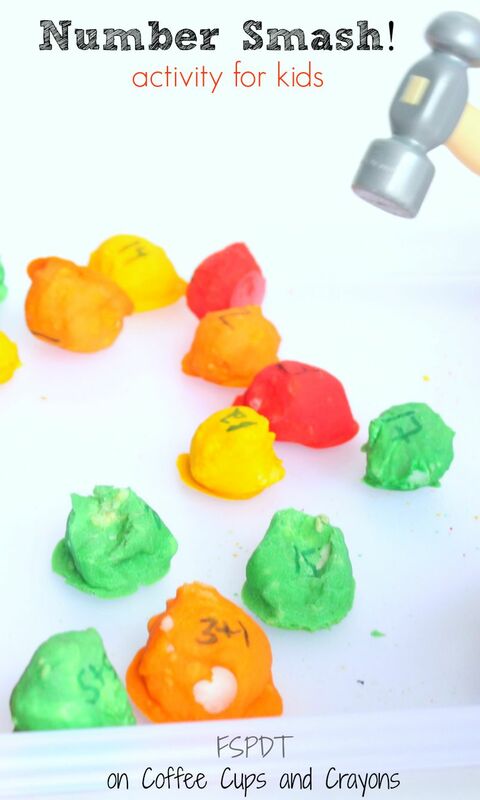 Seeing if you can turn a soft cotton ball into a hard ball would be fun by itself but I also added a fun number activity to it. The baked cotton ball number smash was a big hit. Mix 1 C of flour with 1 C of water. I did this in my mixing cup. I then poured a little of the mixture into a muffin tin. I made 4 colors: red, orange, yellow, and green. 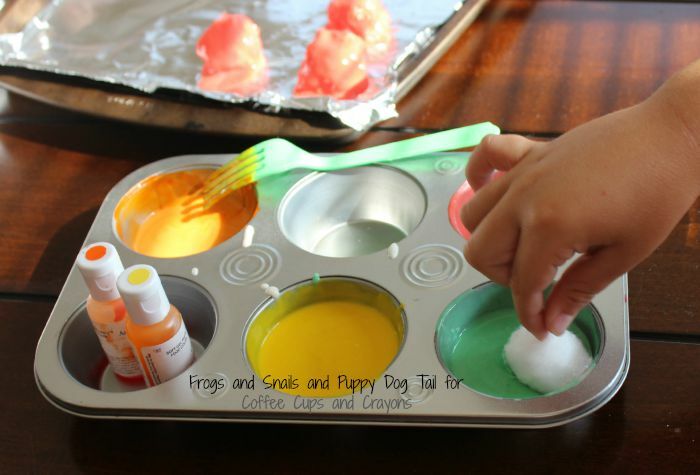 Now take your cotton balls and dip and roll them in the mix one at a time. We made all our yellow and then moved on to the next color. Have wet wipes and paper towels handy because this is messy. 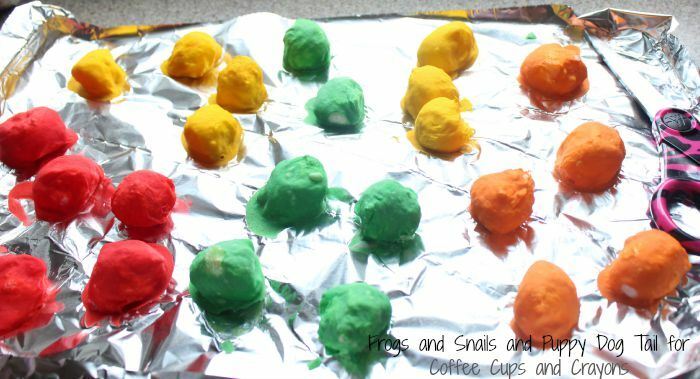 Place the dipped cotton balls on a pan lined with foil. Preheat oven to 300 degrees F before you start. Place the cookie sheet of cotton balls in the oven and bake for 45 minutes. When they came out I left the on the counter and got busy cleaning up. I came back later and checked for any sharp edges. I found very few and just cut them off with scissors. NOW THE BEST PART to me was adding essential oils. I took my Joy and rubbed a little on a handful of the cotton balls. It soaked in the cotton and gave off a wonderful scent. 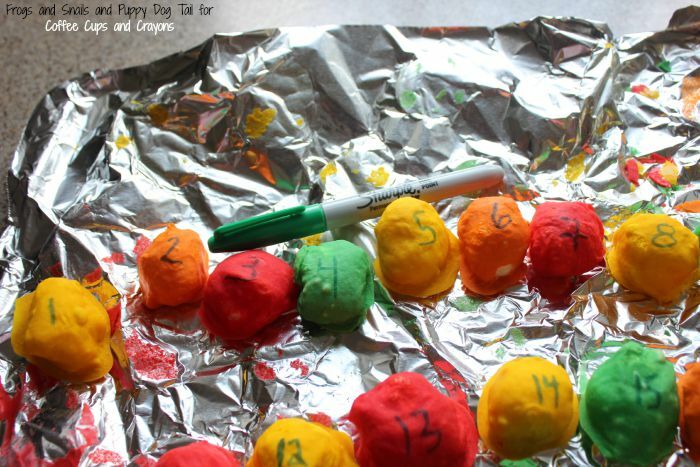 I took the baked scented cotton balls and wrote numbers 1-20 on them. My good old sharpie came in handy for this. I had more cotton balls so I also wrote out some simple addition problems on those. I asked the kids to find their toy hammers and come play. They got really excited about that. I lined the cotton balls up on a tray for them. I asked them to find a number and call it out. 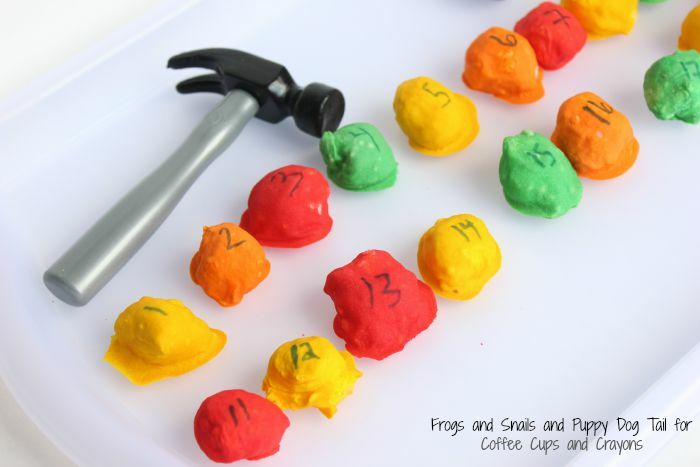 This is great for number recognition for my preschooler. We also counted how many smashes it took to break the cotton ball. For my oldest I had him work on the addition problems before being able to smash the cotton ball. This was a fun way to learn and play. I can see us trying this again!